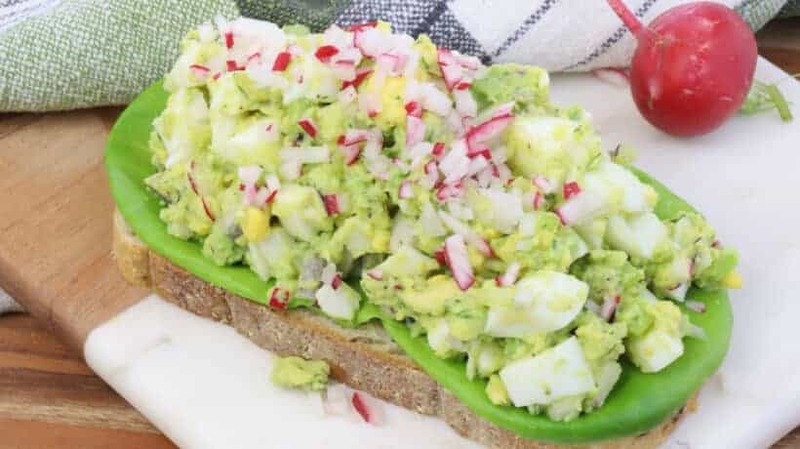 Avocado egg salad uses creamy avocado in place of mayonnaise to put a delicious and nutritious twist on your classic egg salad. 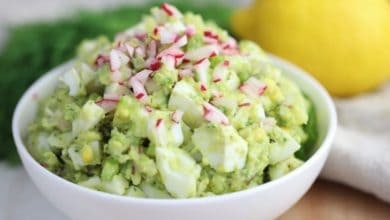 This avocado egg salad recipe uses just a few simple ingredients; hardboiled eggs, avocado, finely diced veggies, fresh dill, lemon and some salt and pepper to taste. It’s very similar to my classic egg salad, but instead of the mayonnaise, I use rich and creamy avocado. Scoop the flesh of one large avocado into a bowl along with a squish of lemon and pinch of salt. Mash the avocado along the side of the bowl, using a fork, until creamy. 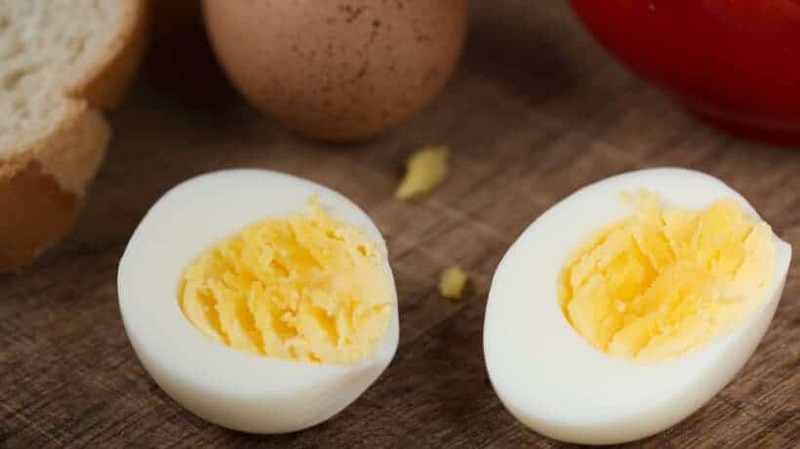 Add hard boiled eggs and hardboiled egg whites into the bowl. Toss in diced vegetables, fresh dill, salt and pepper. Stir everything together until well combined. Serve in a lettuce cup, on your favorite bread or on top of a big fat salad. Place eggs in the bottom of a stainless steel pot, add enough water to come one inch above the eggs. Bring eggs to a boil, shut off the heat, pop on the lid and set your timer for 10 minutes*. In the mean while, set up an ice bath by filling a large bowl with ice cubes and cold water. After the timer goes off, use a slotted spoon to remove the eggs from the pot and place into the ice bath. Once the eggs are cool enough to handle, peel off the shells. 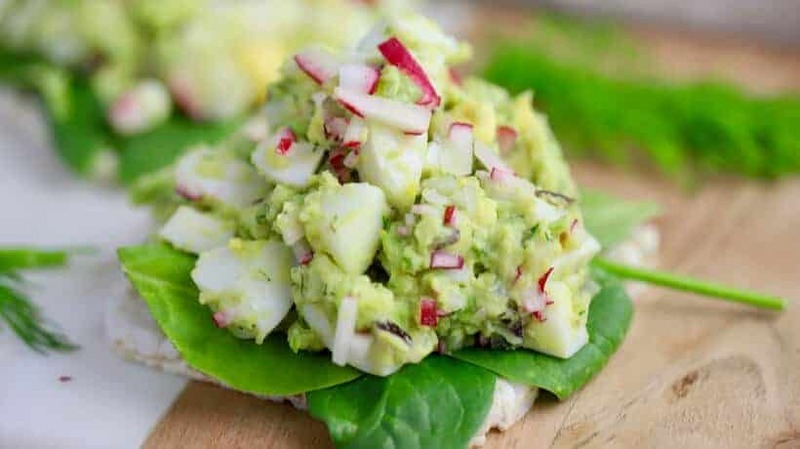 Avocado Egg salad is a healthy, delicious meal to add to your weekend meal prep, but because avocados will oxidize and turn brown, so it’s best to enjoy this salad within two days of making it. Once it’s prepped, transfer into an airtight container and store it in the fridge. If you wanted to make it last longer, prep all of the ingredients except the avocado. Then when it’s time to eat your salad, you can prep the avocado on the spot. This will allow the salad to last up to 5 days in the fridge. Using creamy avocado in place of mayonnaise, creates an egg salad that is healthy, creamy, and delicious. Bring to a boil, shut off the heat, pop on the lid and set your timer for 10 minutes. Once the timer goes off, use a slotted spoon to remove the eggs from the pot and place into the bath. Slice four of the eggs in half, pop out the yolks (you can save them for another time) then chop. Slice the remaining eggs in half, and chop up with the yolks. Scoop avocado into a large bowl and add lemon juice and a pinch of salt. Using the back of a fork, mash the avocado against the side of the bowl until it’s smooth and creamy. Add the chopped eggs and egg whites into the bowl, along with the onions, celery, radish, dill, salt and pepper. Gently stir everything together. Transfer to an air tight container or enjoy on top of your favorite sandwich bread, lettuce wrap to green salad.